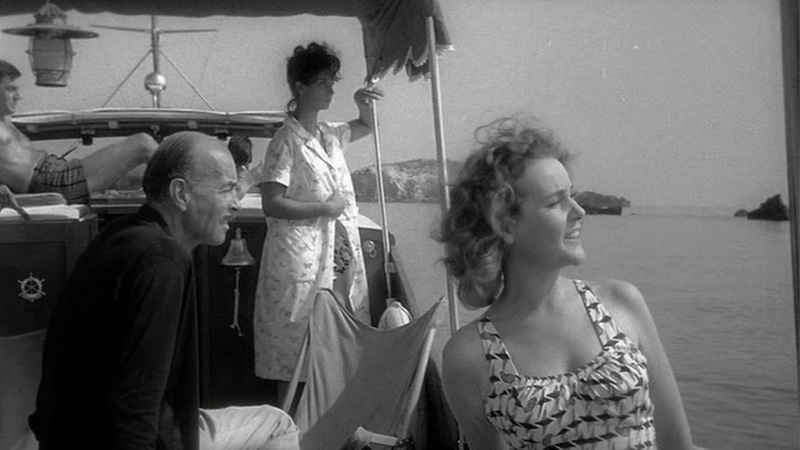 Let us pretend for a moment that Michelangelo Antonioni's “L'avventura” (1960) adheres to the tenets of Hollywood storytelling as handed down by holy scripture, or at least by every screenwriting book published in the last twenty years. The story establishes its initial equilibrium. The rich, beautiful Anna (Lea Massari) and her equally rich, beautiful friends enjoy a lazy boat ride among the Aeolian Islands near Sicily. It is a trip like many they have taken before until the inciting incident disrupts the equilibrium: Anna disappears. This introduces the main tension that will guide us through the second act: Will they find Anna? Every action the characters undertake will, of course, answer that central question in some fashion. Because that's what characters in properly-structured narratives do. It's the only way to escalate the action which is, of course, the only way to keep viewers involved. Anna's friend Claudia (Monica Vitti) appears to be down with the program. She searches the rocky island where Anna vanished and vows to visit every other island in the chain until she finds her. Alas, the rest of her party doesn't share her fervor. Just a few minutes into the search, lovely young Giulia (Dominique Blanchar) frets over how her boyfriend treated her rudely. A bit later, Patrizia (Esmeralda Ruspoli) admonishes a social gathering that they should be ashamed for joking about Anna's fate; they disperse out of a sense of embarrassment for Patrizia who should know better than to think them capable of shame. Anna's boyfriend Sandro (Gabriele Ferzetti) initially joins the search but he deals with his grief expeditiously, quickly turning his attention to Claudia who has the undeniable benefit of being present. Claudia resists his advances. She doesn't want to get distracted from... wait, what was that central tension again? Supposed to be looking for someone or maybe something. Maybe it was Sandro. The film's portrait of the elite class isn't flattering, but hardly anyone comes out looking great. A working-class pharmacist allegedly has a lead on Anna's whereabouts, but his wife is consumed entirely by jealousy. It's OK. Nobody was really following the lead anyway, just going through the motions. Still, for all of its hollowed-out protagonists, the film is even more notable for its acknowledgment that the center no longer holds. This is a world without design, where characters can no longer single-mindedly pursue goals and resolve problems. They pursue their own agendas and devote most of their effort to coping with whatever happens next, often with events that have nothing to do with that increasingly elusive goal. Claudia is constantly looking, not for Anna, but simply looking, through windows and over balconies, trying to make sense of her environment. Sensation is all she's got. Claudia repeatedly insists that Sandro say that he loves her not because she believes it for a second, but simply to hear the words that maintain a cherished pretense. Discussing “L'avventura” entirely in terms of narrative would be a crime. It is one of the most exquisite films ever made with brilliant black-and-white photography by cinematographer Aldo Scavarda. Vitti's perfect face plays its a major role, but witness also the stark beauty of the island where Anna disappears, a massive featureless rock that bursts angrily out of the sea. From atop that rock, Claudia gazes out at the placid ocean, standing out sharply against a drab overcast sky. As usual with Antonioni, environment is spotlighted as a character of its own, not just nature but also the architectural details (walls, doors) characters constantly study while biding time. With its beautiful imagery and its eternally unresolved mystery, “L'avventura” would become the film that placed Antonioni astride the international art-house circuit alongside Ingmar Bergman. However, its legend was only secured with its extraordinary final scene. Standing behind a weeping Sandro, Claudia extends a hand to touch him then retracts it. After a quick but fierce internal struggle that plays out in Vitti's eyes, she reaches out once again, completing perhaps the most significant gesture in the history of cinema, yet another moment that plays like a Rorschach blot for viewers. Does the film end with a meaningful connection or in desperate resignation? A last shot situating a blank wall on the right and Mt. Etna glowering in the distance on the left hint at both possibilities, but interpret meaning only at your peril. The film is presented in its original 1.85:1 aspect ratio. 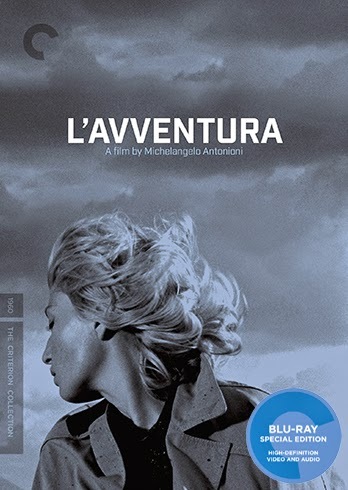 Criterion released “L'avventura” on DVD in 2001 (it retains Spine #98) from a restored print. It looked pretty neat then, but we're spoiled 13 years later and this 4K high-def transfer renders the old DVD obsolete. This movie full of white and gray in its vast negative spaces looks magnificent in 1080p with a rich grain structure and superb image detail throughout. Of the many films in the Criterion Collection, this rates near the top as far as movies you'd want to see in the most immaculate version possible. Short of a 35 mm print, this qualifies. Fantastic. The linear PCM mono track is crisp and distortion free. The dialogue (recorded after production) sounds slightly disembodied and many effects sound like they're recorded a bit “too loud” but that's all part of the original audio design, though sometimes it's hard to be certain. The sound design is evocative but not particularly dynamic. Optional English subtitles support the Italian audio. This is the only disappointing part of the review. Though Criterion released the film on DVD 13 years ago, they have only added one new feature for this Blu-ray release. And that isn't really new, rather a 2004 interview with director and critic Olivier Assayas who provides a three-part analysis of the film running 27 minutes. He describes the movie as “a turning point in the evolution of film” and I'm not one to argue. The other extras have been imported from the 2001 DVD, starting with the commentary track by critic Gene Youngblood. It was recorded way back in 1989 for a laser disc release which surely makes this one of the very few quarter-century old commentaries in current circulation. Mr. Youngblood, you are a pioneer! “Antonioni: Documents and Testimonials” (1966, 58 min.) has the distinction of being the first documentary on Antonioni that was officially approved by Antonioni. I didn't know these needed to be approved. Directed by Gianfranco Mingozzi for the Film Board of Canada, it captures Antonioni at the height of his popularity. Jack Nicholson reads two essays by Antonioni: “L'avventura: A Moral Adventure” (10 min.) and “Reflections on the Film Actor” (6 min.) The latter is fascinating and reminded me of why I love Antonioni's approach so much. However, Nicholson deflates some of the bold claims in his own commentary about “Working with Antonioni” (5 min. ), noting that the director was prone to contradict himself frequently. The fold-out insert booklet includes an essay by critic Geoffrey Nowell-Smith (orig included in the 2001 booklet), a reprint of Antonioni's comments upon the film's 1960 Cannes premiere as well as a short statement from the Cannes film jury addressing the controversy the movie generated (people wanted their comfortable meaning and structure) and defending the film's quality. “L'avventura” is one of the movies that me want to study and write about movies. I love it more with each viewing and it is pretty darned exciting to see it in such stunning clarity. The lack of new extras is a disappointment, but the high-def transfer is easily worth an upgrade all by itself.